The latest wonderful addition in Frankie Cosmos' extensive catalog. I had heard of Frankie Cosmos through friends who were fans and decided around two weeks ago to see what they were so excited about. When I found her bandcamp, I discovered that there has been a Frankie Cosmos release almost every month since 2011. I was a little overwhelmed but decided to give January's Wobbling a listen and found myself mildly obsessed. The music – lightly confessional but also silly lyrics over warbling guitar and keyboard – fits in perfectly with the Julie Doiron and Dear Nora phase I've been going through. It's a beautiful gem of an album and I'm realizing as I make my way through her discography that this statement is applicable to any collection of songs. There isn't much concrete information about the project online, but from what I've gathered Frankie Cosmos is the pseudonym of one Greta Kline, who also makes music with an ensemble under Frankie Cosmos and the Emptiness, Ingrid Superstar and Ingrid and the Ingrates. Greta lives in New York, appears to really like dogs (who can blame her), and is obviously pretty prolific if she can release such a high volume of music and have it all be this good. Her songs make me feel the way I did the summer I turned sixteen and make me wish I had a prettier voice. I have an inkling that Frankie Cosmos is going to be the soundtrack of these next few months before I have to move on to the post-grad real world. 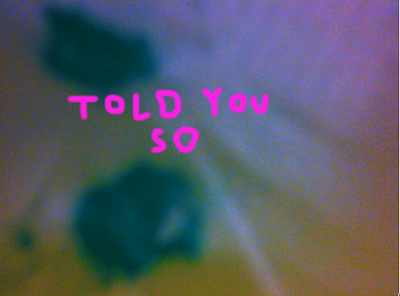 Told You So is the very most recent release by Frankie Cosmos as it only appeared on bandcamp a few days ago. In Told You So, Greta sings songs that are under two minutes long about getting high and the inability to get Little Debbie's Cosmic Brownies, wanting to break up, and her computer malfunctioning while she's trying to record. While some of the other songs on her many records (the ones that I've listened to at least) feature keyboard, these songs are purely guitar-based with the occasional background noise and harmony nicely mixed in. There's only eight songs but I've listened to them over and over again, from the opening track "havin a house" which might have my favorite lyrics of the album (including: "I was crying at the diner, you were having wine with her, see what you did, I'm losing it") to the charmingly lovesick shyness portrayed in "can't hear the words". I think I love Frankie Cosmos so much because the music is emotionally relatable without getting too heavy – sometimes boys really bum me out and sometimes I just want cosmic brownies when I'm fucked up (did I eat three the other night when I was drunk? maybe). The album is only about twenty minutes long and is completely worth your time. I'm hoping I can eventually make it through all of the Frankie Cosmos releases and that Greta eventually got those cosmic brownies. Listen to Frankie Cosmos on bandcamp.